Today we’re going to strip away the fluff on website design and show you exactly what your website needs to add serious value to your business. There’s a common myth that websites only need to cost $500 – $1000. “My nephew designs websites and he said he’d do it for free”. I’m sure your nephew designs great websites, but if they really were that good, he wouldn’t be doing them for free. Have you ever heard of a great lawyer or accountant being so good they don’t charge anything? They’re both skills that anyone can learn, but you get what you pay for. You wouldn’t say “my buddy is a lawyer and can defend you in court for fifty bucks” to anyone who you honestly considered a friend. A $500 car is vastly different than a $50,000 car, even if they are the same “color” “make” and “model”. There is something seriously wrong with one of them in order to facilitate the price. Your website should no longer only be considered ‘a little place on the internet that’s yours’. If it’s a genuine addition to your business, it should absolutely be providing a measurable impact on your business – via leads, sales, and better customer relationships. 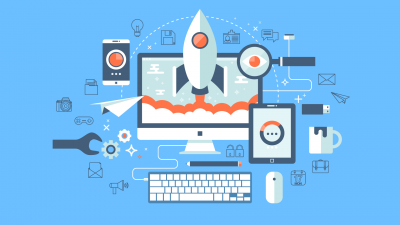 Having a website alone isn’t enough for your business to thrive. You also need to produce useful and relevant content for your target audience. Ideally, that’s all your business should be focusing on: Helping your customers, and being useful and valuable to them. If your customers find you useful, eventually your non-customers will too. The reality is – you’re having to compete with so much more now. The level of noise on the internet is crazy, and it’s only going to get louder. What helps you to stand out over your competitors, and over other distractions (Facebook, Netflix, Etc) is providing epic, useful content that people want to read. It’s as simple as that and that alone. So what’s the cherry on top? You need to collect email addresses and leads and market to them effectively. Your website can only do so much. But what it can do, is SERIOUSLY top up your sales pipeline with fresh, hungry leads. Waiting seconds to a user on the internet, is like waiting hours for a bus. The simplest problem to fix with a website – and something that everyone will experience at some point – is a website plain not working. It might load slowly because the hosting is poor, or images aren’t optimized. If you’re not paying enough for your hosting, the website could take seconds to load. And seconds to a user on the internet, is like waiting hours for a bus. Another issue that websites face is ‘broken code’. A single misplaced character can break an entire site. But typically, website updates, CMS updates and platform changes can break a site, even if everything was working minutes earlier. If you don’t pay for a proper, well maintained and updated site, your website WILL break. Finally, the most common reason sites are slow or break is because they’re insecure. Users (yes that means you) don’t change passwords, don’t pay for quality hosting, or update their site regularly. Malicious people, computerized robots or actual bored humans can then hack into your site and ruin it. It happens all the time and it’s actually quite easy to prevent. But much harder to fix. It’s up to you. We see many businesses write about and publish content that is completely not aimed at their target customer. If you’re an accountancy, talk about stuff that help your customers. Talk about saving money. Talk about how to find better suppliers that deliver more. There’s a huge misconception that if you work in a specific industry, you can only ever talk about that industry and those products. The truth is that you should be talking about your customers and helping them. Talk about what they want to hear, not what you want to say. Don’t – as I see so many businesses do, talk about things that would appeal to other people in your industry. We see so many businesses write and create content that would be better suited to be read by their competitors. A much better approach is to write for your customers. Finally, and this is the most common issue we see, you need to create content and update your site regularly. We often see people publishing and launching a website, and months later, the blog section is still empty. We know it sounds hard to create content every week, but it isn’t. If you’re struggling to think of things to say or talk about, we can help you. If you genuinely don’t think you have anything to say, then what the hell are you selling? Talk about what your customers want to hear. I promise that you’ve got more content than you realize. Find it and get it to work for your business, generating new leads and customers. So how do you just totally NAIL a website? First, you need to commit to producing one new piece of content every week. It’s as simple as that. If you have a plan, it’s really not as daunting as you think. The easiest way to get started is to think of 5 broad topics that your customers want to hear about and that you want to talk about. If you’re a florist, what are the 5 basic topics that come up between you and the customer. For example, Valentines day, caring for bought flowers, flowers for funerals, Mothers Day and allergies. What are most common questions that you get about those topics? What do customers email you and ask you in store? What are you constantly having to tell people when you first meet them? You could do each question as a post or have a commonly asked questions post. Think about topics that customers SHOULD know. Things that they discover as they use you more and get to know your products. Talk about the results that they can get or success stories you’ve had. Make sure you’re talking about YOUR business and what makes you different. Who are the people in your business and what’s their take on the broad subjects? Even if you just took these 3 questions for each broad topic, that’s 15 pieces of content. Once someone has read your post, we want them to sign up. We want them to give you their email address and contact info so you can market to them. That’s where you offer another useful, highly valuable piece of content in exchange for an email address. Ask them “if you liked this piece about [topic], then you’ll love our guide to [topic]”. Focus on the benefit to giving their email address and showing them what they can do after they sign up. Think about what the next logical step would be for someone reading that blog post. For example if I’m reading a post about buying a new phone, the next logical step would be a guide on the 5 best phones of 2017. Keep your next step related to the original content. Make it a next step or an added bonus. What would someone TRULY want to see next if they were reading your content? White space is good. Don’t over complicate your website design. Make it easy for people to use and read content by keeping white space and making it uncluttered. Keep it to a few colors per page. Common misconception is that good design is a lot of good color. It isn’t, it’s few colors used well. Don’t go nuts, less is more. Nice images are nice. Take 15 minutes to find high quality stock images (they can even be free) – and help people visualize the story you are telling. Break the text up. Separate out points and keep it minimal. Prioritize what points you want to get access. Focus on one CTA per page/post. On that note, keep the action that you want someone to take easy and singular. Just sign up or just call. Don’t over complicate it. We love the idea of asking “if you liked that, you’ll love this” for next steps. We use it on sign up forms and landing pages all the time. A lot of customers ask us “well why should we pay more if so-and-so down the road can do it for $500?” We understand what you’re saying, but what our customers have found is that they don’t have to pay for expensive fixes to their site if they invest properly. You need to input a certain amount before you get anything out of anything. You have to invest to receive. Don’t pay for cheap websites because you’ll keep paying for them in the long run. Good design that gives a return isn’t complicated. You need to create regular content that your customers want to read. If you liked our blog post on websites (see what we’re doing?) then you’ll LOVE our traffic guide on delivering more traffic and visits to your new epic website. Download here. Download Our Free "Traffic Checklist" And Start Getting Higher Quality, Laser Focused Website Traffic Today! Simply enter your name & email address below and get free instant access to our 24-step traffic checklist! Great! Keep your eyes on your inbox! Spam is a meat product that's vaguely popular in Hawaii. We're not interested in that! 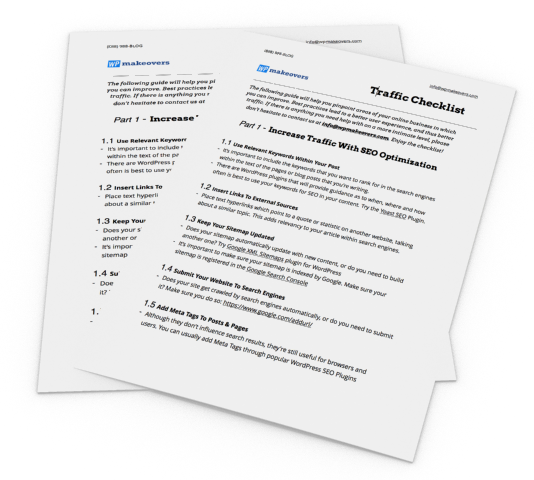 Download Our Free "Traffic Checklist"! Simply enter your name & email address and we'll send you a 24-step guide to start getting high quality, laser focused traffic! Spam is a Hawaiian meat product. Who Cares About A Website Care Plan?